–The ingenious design behind Errol Morris’s indelible trademark of showing people making eye contact with the camera. Well, it looks rather like a picture won’t always do – just to say the Erroll in front of the interrotron is where the interviewee sits looking at Erroll. And Errol wouldn’t be looking through the camera eye-piece -that’d be the cameraman – but off to the side looking into video camera as per the nice colour diag. The film, which premiered earlier this month at the Toronto International Film Festival, portrays Assange as a visionary with democratic ideals for information and altruistic motives for whistleblowers, but also as a lying, reckless revolutionary who ultimately sabotages his own creation by his refusal to consider the lives of revealed sources in published documents. WikiLeaks has just released a script of The Julian Assange film The Fifth Estate, starring Benedict Cumberbatch, in cinemas 11 October 2013, in order to refute in detail the veracity of the story as depicted in the script which might not be the final version. Um? As means of showing a script this is brilliant. Top / Script / Scenes / Memo buttons. Top seems slightly redundant. Memo is Assange’s gripes and wines. [a] a WikiLeaker saw film on 5 September 2013 and WikiLeaks now claims the script published is substantially the film. (this is the bit that drives me mad – WikiLeaks this and that, when actually it’s one rather vulnerable man in a broom cupboard in a Small South American country’s London Embassy a stones throw from Harrods, with a few chaps and chapesses he calls for favours. WikiLeaks is Leaker facilitator now lacking, we are informed, a means to leaks since the software has gone missing. [b] A la WikiLeaks: there are other versions of the script in their (his) possession. 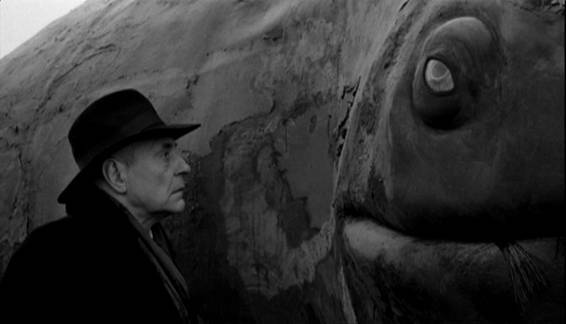 [c] The fictional film [recognition..] misrepresents, distorts, omits. But never mind about that, click on scenes button. Columns of numbers. Click on one get your scene. According to TIFF, the film was based on Inside WikiLeaks: My Time with Julian Assange at the World’s Most Dangerous Website (2011) by Daniel Domscheit-Berg, former WikiLeaks spokesperson [WikiLeaks Defector Slams Assange In Tell-All Book By Kim Zetter], as well as the 2011 book, WikiLeaks: Inside Julian Assange’s War on Secrecy by David Leigh and Luke Harding, both of which Assange claimed were inaccurate. WikiLeaks says it’s a ‘mature’ script and the director says it is a, well, an immature one. The film looks as if it’s a fiction. And why not, as Barry Norman might have said. As it should be. Who wants a transcript of a life, right down to a torn condom scene? 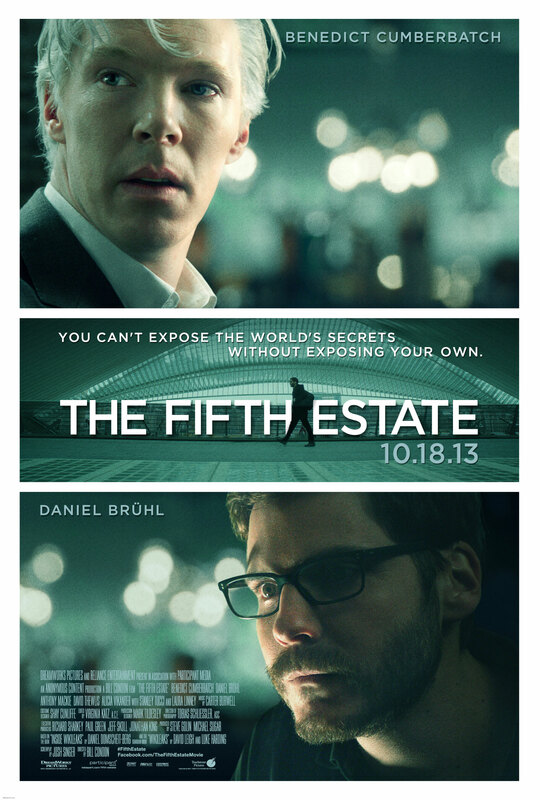 That’s a point, is there a Swedish condom scene in The Fifth Estate? And were the condoms Swedish. BUSHY-TAILED TO WOMAN FACE DOWN ON PILLOW. MAN – LAPTOP ON HIS LAP. Man : Gee-whiz. Bonza. Must do that again soon. How about half an hour? Where’s the dunny? NOTICES USED CONDOM ON BED-SHEET. SLIDES IT UNDER THE PILLOW. Has a film about a real live (or dead) person ever been a completely accurate record of that life? Would a faithful set of correspondences make the person come to life? Thinking of how a photograph can be mapped against the reality it has snapped and yet it’s more than reality: it’s a moment in time, but more than that – how a work of art, a portrait, captures an essence of the person, or something he has tried to hide. A photograph can do the same thing but in a different way. That little something caught might not be something the painted wants to be shown. 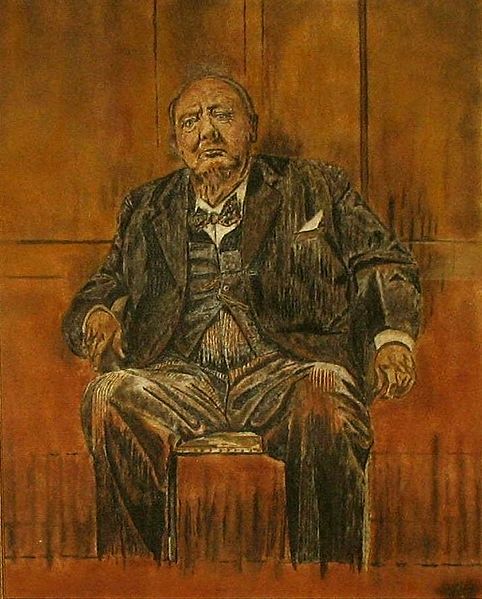 The Sutherland portrait of Winston Churchill, immediately comes to my mind. It’s gone. Lady Churchill, if I remember correctly destroyed it herself. This the wiki says was created in 1978, by sand artist Brian Pike using natural coloured sands. Mind you, don’t think he liked the earlier film either. That again was not a true depiction of Assange as Assange sees himself. To be fair to him he is on about factual inaccuracies. What he does in trying to control his image is not unique. The higher up the greasy pole you get the more you want control of how you are seen by others. And yet, as for L’Assangne [yum, yum, tomato sauce, fresh Italian herbs] once the image wanted is mischievously being played with by others, and the fight back is too hard, picky about little points, it all becomes self-defeating. He has a right to defend himself on the important areas like the Swedish sojourn that went pear-shaped. But he becomes a figure of fun when he flails like a blind man trying to grab at things. The control-freak is the pettiest of people. He is the man (or woman) who sits in of an evening, cutting photographs up to remove people from them who are no longer part of his life. presented a wonderfully simple graphic to explain an experiment carried out in her lab. If you want to know yourself, look at the other; if you want to know the other look at yourself. People are designed by nature be able to read minds. And when it comes to art, photography, film, the same processes go on. By the way, if you watch the TED, Blakemore mentions an anecdote: pre-teen’s misbehaving in a shop told by dad would sing them a song if they behaved, were happy to stop for the pleasure of listening to Dad trying to sing A Boy Named Sue, while after puberty the same offer was seen as a threat. What will always be fascinating and mysterious is how the bare facts of a life can be unexceptional or seem 2-dimensional simply because we didn’t know the person – till something is done to those facts. Fiction has many purposes – one of them is to breathe life into personality and character in a way a description of a life itself doesn’t seem to be able to. This not to say many lives aren’t riveting from real life, recorded or off the page. But these are abstracts not autistic-like recordings of every millisecond of a life. Even someone one comes into regular contact with amounts to a series of gaps where we know little or nothing about the person. 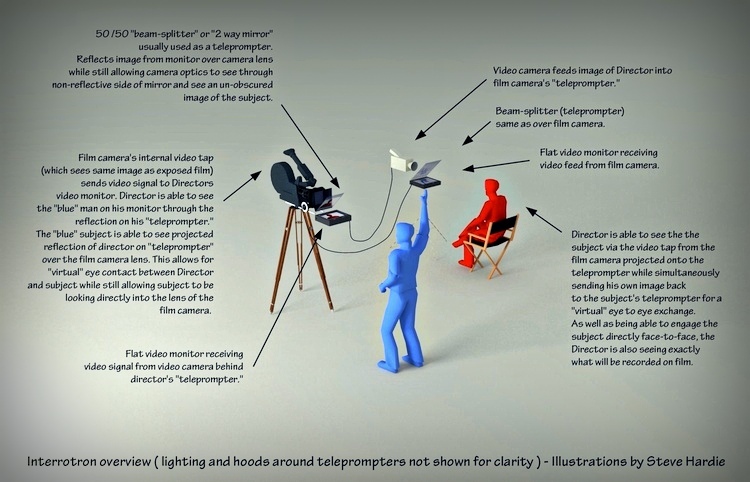 Filming something or recording audio, at very great length, without editing into a shape – can nonetheless have a hypnotic effect. We would know a lot more about the real Assange, for example, if a camera had been turned on from his birth right through to the present day. Well, of course we would, but y’know wadimean. From that we could see the man he wants to project out into the world would clearly be seen as a concoction, a fiction. True of every one of us. And so the film-maker concocts in turn. But back to Assange and his script. Is he thinking about suing? What will he think when he sees the film as against the not final script? When will the DVD be out or will he use NetFlix? Does he pay for internet connection? So many questions. What exactly is defamation? Are the film producers of Fifth happy to go ahead because the stuff already produced hasn’t had suits slapped on them by WikiLeaks Inc.? Well he can’t do any slapping down of writs – he he has no money. Defamation is a communication from one person to another about an identifiable third person which lowers the reputation of the third person. If a film maker creates a film depicting a real person in a way that would lower the reputation of that person, and the film is released, then the film maker may be liable for defamation. The film maker may be sued for defamation by that person, or by their family or business partners. No film would be released if the production company thought they were going to get sued, surely? (Though plenty of suing has gone on over the years) People invest in these things. They want a big return on their investment. Or, rather, they know if a film is a success at the box office, they will make a lot more than putting their dosh in an ISA*. The really fun one, nothing to with Assange and art over self-image, is when a film producer/director takes money for a proposed project, then doesn’t make the film. Haven’t they made a film about that? The one about the script which is just a cover for mob money. Terrance Malik seems to be being sued for taking money for one film and using it make another (or three). Pasolini Study Day at the BFI. 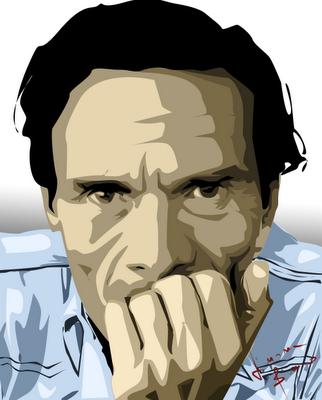 Stimulating and engaging programme of talks, discussions and screenings (hosted in collaboration with the University of Sussex’s Centre for Visual Fields and School of English) exploring the work and thought of Pasolini, one of the greatest filmmakers of his generation and a fiercely original – and controversial – public figure. A prestigious line-up of speakers includes Adam Chodzko, Rosalind Galt, Robert Gordon, Matilde Nardelli, Geoffrey Nowell-Smith, Tony Rayns, John David Rhodes, Filippo Trentin and his favourite actor: Ninetto Davoli. She’s provides a mountain of a film resource, but I find a lot of the academic stuff largely incomprehensible and distracting from film itself. Love film? Watch films. The previous post about novel and screenplay made me think again of Pinter and his Proust Play. No date on this pdf. But she’s a prof. at Wasada University with one of her research areas listed as: Harold Pinter’s plays, screenplays, and prose. The idea came to me to search on novel vs. script, without really knowing precisely what I was looking for. Mostly about, Am I writing a novel or a screenplay?, and if others puzzle over and articulate on this. But one thing leads to another. 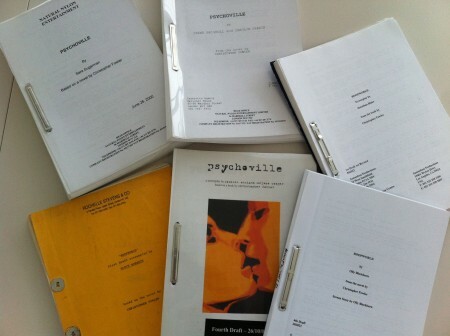 Rebecca Chace, a published novelist, writing in Publishing Perspectives, did screenplay to novel to screenplay: Literary 360: Rebecca Chace on Going from Screenplay to Novel to Screenplay. Summary: if you write a screenplay then feel like writing the novel, put the script away and write from scratch. I don’t think I could do that. I’m pretty sure I’d be checking scenes in the script and trying to pad it out with prose and re-jig. Though they say since a script is for a film – sound and vision – how you piece together the story is so radically different in a novel, that’s not going to achieve the result. True perhaps of the narrative structure, but the scenes you have written in a script can be visualised so well, are bound to be there as you write your novel. After all you sit there seeing the scenes and then you write the script. I can see one particular part of a story I wrote. I can live inside this place, move around it so easily, even ‘film’ extra shots and re-see them edited in where I think they might fit. How to ‘epoché’ the lot written as a script to sit down and write from scratch looks impossible from where I’m sitting. At the same time, how can you not think of the beginning of a novel, a long, drawn out languorous first few paragraphs, and not see it or attempt to frame it visually? O.K., pick a really hard one to be awkward. Para 1, Book 1, The Man Without Qualities by Robert Musil, [Wilkins/Kaiser translation]. There was a depression over the Atlantic. It was traveling eastwards, towards an area of high pressure over Russia, and still showed no tendency to move northwards around it. The isotherms and isotheres were fulfilling their functions. The atmospheric temperature was in proper relation to the average annual temperature, the temperature of the coldest as well as of the hottest month, and the a-periodic monthly variation in temperature. The rising and the setting of the sun and of the moon, the phases of the moon, Venus and Saturn’s rings, and many other important phenomena, were in accordance with the forecasts in the astronomical yearbooks. The vapour in the air was at its highest tension, and the moisture in the air was at its lowest. In short, to use an expression that describes the facts pretty satisfactorily, even though it is somewhat old-fashioned: it was a fine August day in the 1913. …the screenplay can be an excellent first draft for a novel. Anyone who has started writing a story, who is interested in both forms, knows this can go either way. And sometimes there can be such a conflict that a novel and a script are developed in parallel without a final decision about which to finish and which to drop. The advantage of doing both is if you were shifting more to novel – but you’ve been playing with a script – you’re ready to think about the adaptation! Then there’s the thing about writing a novel in a film like way. Common now. But go back to writers like Graham Greene. Peter Bauer says briefly pretty much the same thing (‘The differences between a screenplay and a novel are equivalent to the differences between a blueprint and a finished building.’ ), but shows how the script can’t just be transposed into a novel and why. All these things are what you work out for yourself but it’s handy to have someone laying it out clearly. Screenplay vs. Novel in Anatomy of Perceval, 20 July 2013. All sorts of writing things and 6 degrees to. 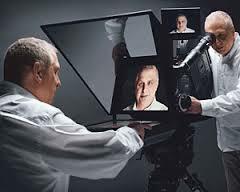 Errol Morris’ Five Golden Rules of Movie-making drew my eye. I’ve watched his films and wondered what exactly he was offering. Well, there are 5 rules, succinct as they are, but the post is really a mention of his new documentary on Rumsfeld, The Unknown Known plus a short YouTube clip of the film – The Unknown Known. Look forward to watching it. Morris made his name with The Thin Blue Line . wiki: Errol Morris. I was recently drawn further into Errol Morris’ world by reading some of his NYT Opinionator series, the latest of which can be found on errolmorris.com. If you’ve never read any of his pieces, I recommend his 2007 Which Came First, the Chicken or the Egg? [a two-parter] It’s a load on balls: canon balls: a detective story on the photographer Roger Fenton’s Crimean War photograph, The Valley of the Shadow of Death. I saw that! His English was so French, most listening probably didn’t get it at all. I’m not saying we can bracket Donald Rumsfeld and Eric Cantona, but they have both come up with the sort of thing that’s sure to make journalists at press conferences look sideways at each other, curl an eyebrows, slap laptops shut and suggest an immediate pint or three at the nearest local hostelry. There is a transcript of the 2002 briefing in which Rummy let it be know what one knows, doesn’t, can’t, ought to, etc. But why not let DR himself run through it first. An abstract from the intro of his memoire Knowns and Unknowns, shows where he got the knowns and unknowns from, which is easy to find out from other sources. The quote became a subject of much interest and derision and not a little thought. Even Zizek had his say, suggesting a further unknown, the unknown known. Unknown knowns and Zizek: why are the Americans fighting this war? written in 2004, explains and develops. 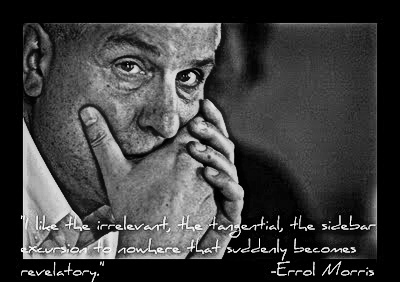 If Morris’s documentary doesn’t deal with the quote at length there’ll be much surprise all round amongst Errol Morris fans. Xan Brooks in The Unknown Known: Venice 2013 – first look review, Guardian 4 September 2013 confirms the quote is in. This words and reality thing fascinates me. Generally. A paper by Simon Biggs, Between zero and one: on the unknown knowns, mention of Hallam, E & Ingold, T (2007), Creativity and Cultural Improvisation. They claim according to Biggs that “life is unscriptable” and “cannot be codified”, for the world is not a fixed but fluid phenomenon. Having not seen the film yet, I’m in no position to disagree or agree. You’re a cut and dried result type of person – in fiction or non-fiction – or you’re happy to see something incomplete or unresolved. Unfinished, inconclusive, disorganised, fragmented is o.k. by me, as long there is something in there, a little nugget that sparks interest or curiosity. Even just a style of doing something which ultimately fails to deliver. If in a book, a painting, a music composition, a film, something doesn’t quite come off, witnessing the attempt might be worth it alone – that we have learnt something anyway. An scientific experiment never fails – a positive or negative result is still a result – it just doesn’t agree with the hypothesis. I’m looking forward to the old warmonger reading out his own notes and commenting on them. Will he start picking out words and re-examining them? Errol Morris Working On Donald Rumsfeld Documentary is the site I lifted the image of Rumsfeld from – a Time cover. Idling my time till The Unknown Known comes out on DVD, I did a bit of reading on Rumsfeld and came out of it with a deep re-affirmation of a prejudice about the U.S., which was so vehemently expressed by Harold Pinter. At the top it’s a venal, corrupt and amoral society. So top-down, the grasping spreads to the lower stratas. There are sure to be thousands of honest, decent capitalist sausage-makers in the land of the free, who hopefully don’t cheat their workers out of the value of their labour [but don’t bank on it], or their customers either by what they put in their bangers or in over-pricing them, but at the top of this society [in any society perhaps but notably America], as it is easy to see, are a lot of rum Rummy-like people who lie and cheat their way to great riches and have a vicious, nasty un-sympathy for the underdog. Scott A. Gray’s review, The Unknown Known Directed by Errol Morris, is my core review for now. Looks as it might pretty much cover it. I’ll be on the look out for more as the film is seen more widely.